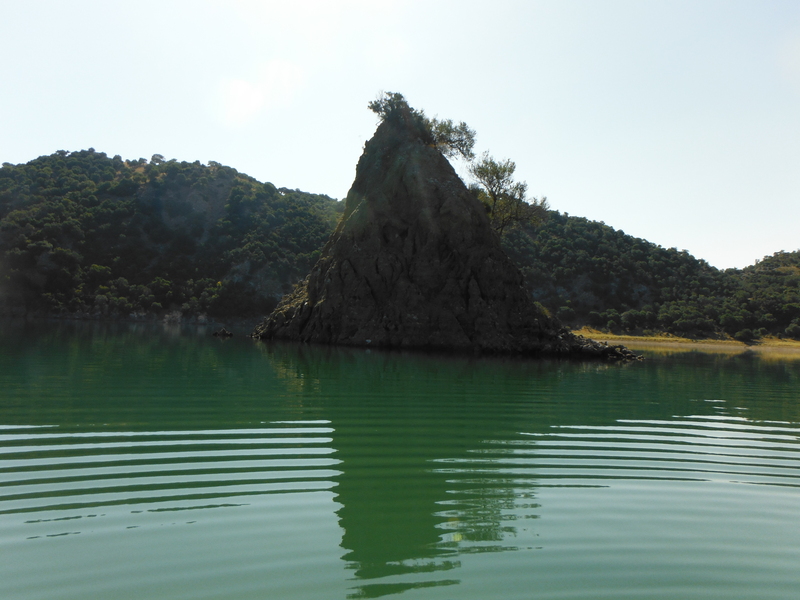 I have fished this huge reservoir, the largest in Cadiz province, several times now, most recently with a little “band of brothers” consisting of myself, my son Leo and a few of his mates and, despite this, I came to realise I knew little enough about the reservoir itself. I have since tried to make amends and what I have learnt is very interesting. For starters it is the water which has produced the heaviest bass recorded in Spain, a 4 kg whopper. This fish was taken in 2000 by a Malagueno. The part of the reservoir I am familiar with myself, close to the town of Algar, certainly has every appearance of providing the kind of habitat that bass thrive in. 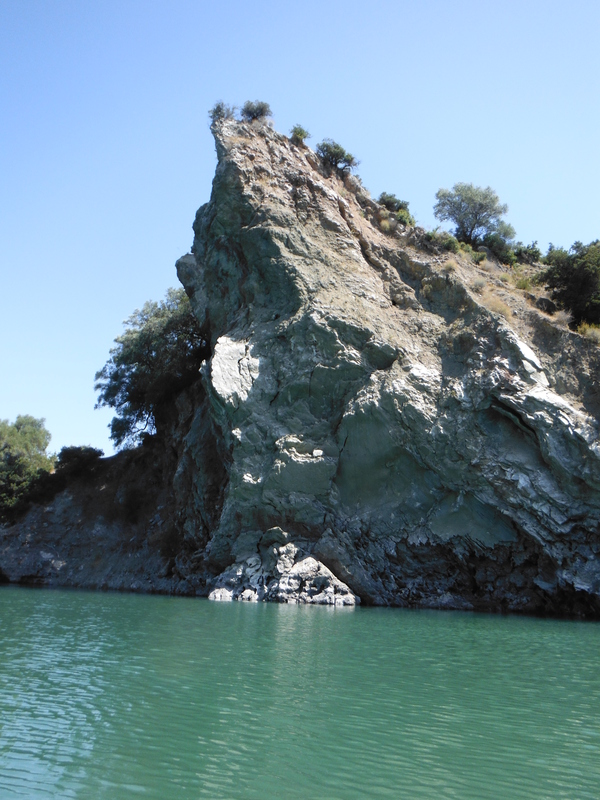 There are plunging rock faces, caves, drop offs, submerged trees, islands. In short, it has everything. It is not difficult to imagine enormous bass hovering on the edges of drop offs or among the branches of submerged trees. When we were there the other day Leo got chatting to some guy who knew the bass record holder and he said it came from a kind of cave close to an island and I am pretty sure I know which one. I fished around the island itself and took fish from tight against the base.I even fished in an around the cave of the record fish but there were no giants for me! In fact the bass, though numerous, tend to be small even though there are certainly some exceptional fish. The bass fishing is so good that the reservoir has hosted the national championship and in 2012 the world bass fishing championship from the shore. 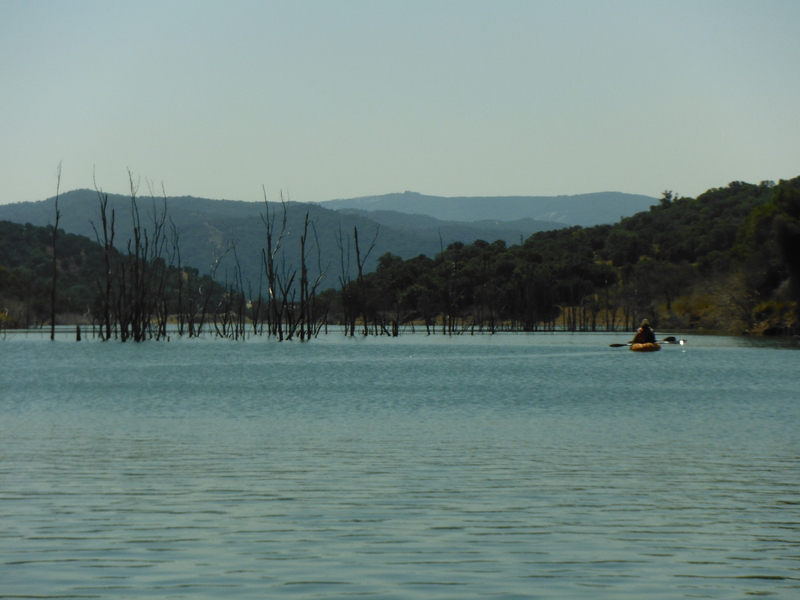 Motor boats are not allowed on the reservoir but the float tube is ideal, as are kayaks which can be hired at Tajo de Aguila. Right, I´m not going to go on yapping about this place. If you ever happen to be in this neck of the woods it is well worth a visit. The scenery is simply stunning and I can think of nothing better than finning around this place in a float tube and catching and releasing black bass. This island provides some shaded water throughout the day. There were bass here tight against the base. The Spanish record black bass was taken very close to this spot. 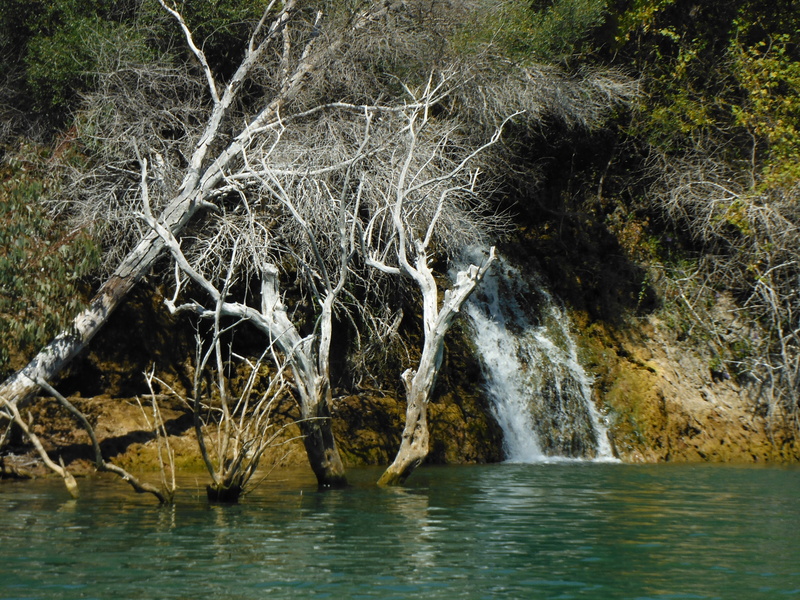 A tumbling waterfall, submerged trees, what more could you ask for? Trees emerge from the bottom of the reservoir. The reservoir is about 20 years old. Presumably they were once growing on dry land. In this arm of the reservoir there is relatively deep water straight off the shore. 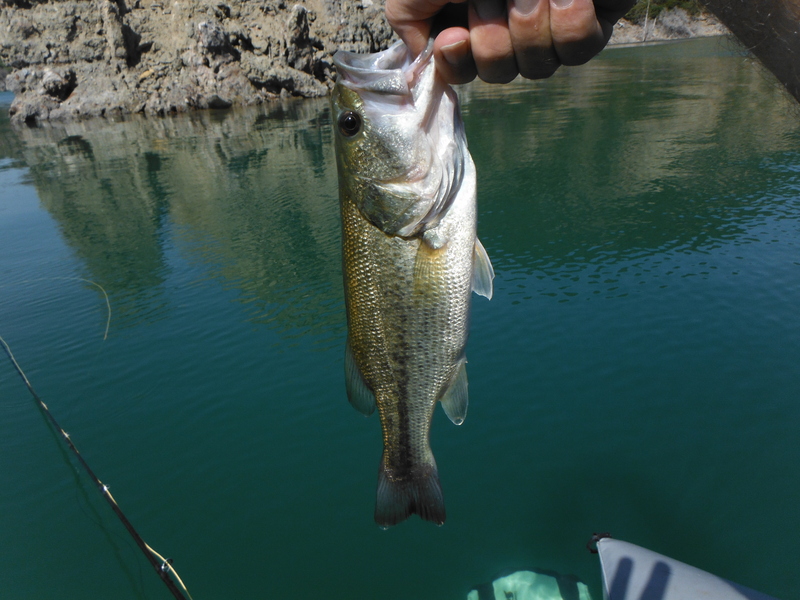 The margins are often where the bass will be found. The scenery is stunning here. 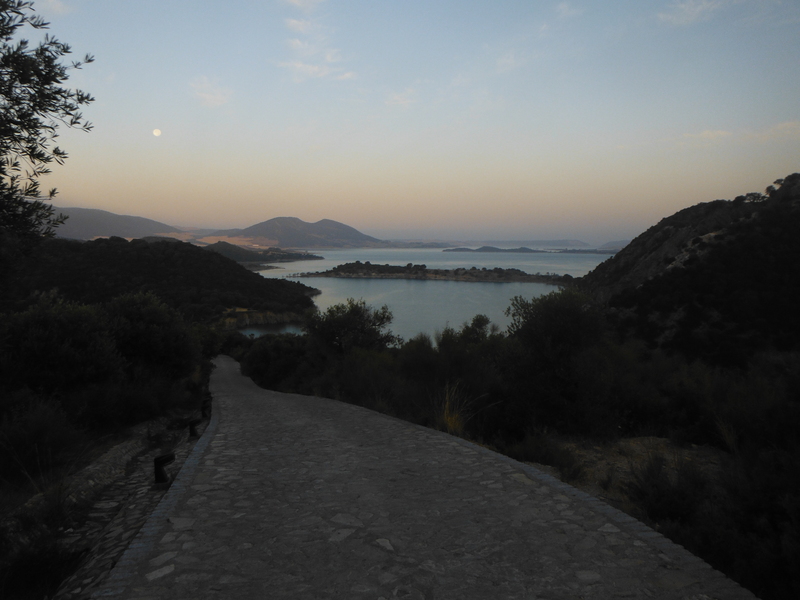 A view of the reservoir from Tajo del Aguila. Black bass. These are not endemic to Spain but have been widely distributed here and are a very popular sport fish.